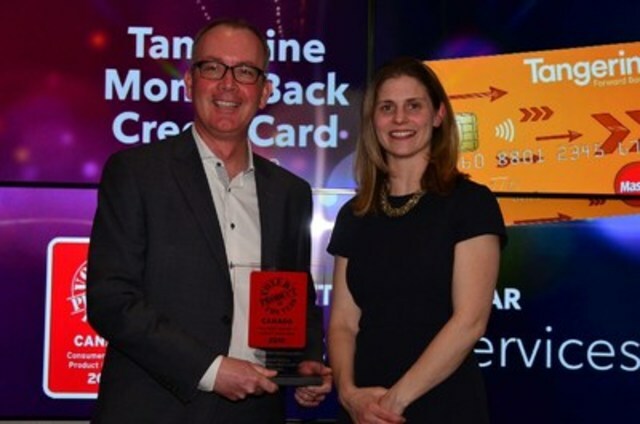 TORONTO, April 4, 2016 /CNW/ - Tangerine is pleased to announce that following a nationwide consumer vote, the Tangerine Money-Back Credit Card was voted a winner in the 2016 Product of the Year Canada awards program in the 'Financial Services' category. This win comes on the heels of the Card's official launch this week, following a successful Preview phase. 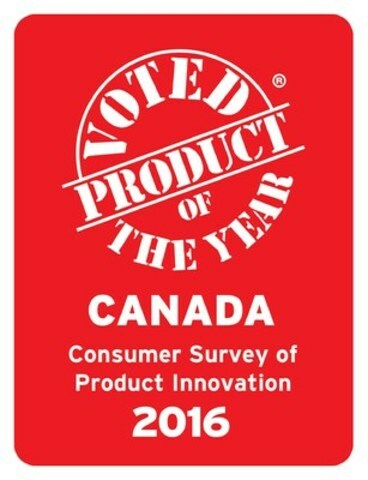 "We're proud to be recognized by Product of the Year, particularly because this award was voted on by Canadians." said Scott Lapstra, Managing Director, Credit Card Products at Tangerine. "Our Card is truly unique, as it helps our Clients save even when they're spending, which is a testament to our focus on helping Canadians make smart decisions with their hard-earned money." The no annual fee Tangerine Money-Back Credit Card, powered by MasterCard, is currently offering 4%* Money-Back Rewards instead of the usual 2% on purchases in two chosen categories. All other purchases always earn 1% Money-Back Rewards. If cardholders choose to have their Money-Back Rewards redeemed into their Tangerine Savings Account instead of back on their Credit Card, they can choose a third category that earns the higher Rewards rate. Tangerine's Money-Back categories include restaurants, grocery, gas, entertainment, home improvement and more. The current double Rewards offer is valid for new cardholders for their first 3 months and is also in effect for 3 months for Clients who received the Card during the Preview phase. "We're thrilled to see Tangerine's first credit product win this award," said Jim Douros, Vice President of Account Management, MasterCard Canada. "The Money-Back Credit Card offers Canadians a simple, effective way to be rewarded for everyday spending - all with the benefits, safety and security of MasterCard. It's a winning combination and we're proud to be Tangerine's exclusive network partner." To apply or learn more about Tangerine's Money-Back Credit Card, please visit tangerine.ca. Tangerine is a direct bank that delivers simplified everyday banking to Canadians. With more than 1.9 million clients and close to $38 billion in total assets, we are Canada's leading direct bank. Tangerine offers banking that is flexible and accessible, products and services that are innovative, fair fees, and award-winning client service. From no-fee daily chequing and high-interest savings accounts, GICs, RSPs, TFSAs, mortgages and mutual funds, Tangerine has the everyday banking products Canadians need. With over 1,000 employees in Canada, our presence extends beyond our website and Mobile Banking app to our Café locations, Pop-Up locations and 24/7 Contact Centres. Tangerine was launched as ING DIRECT Canada in 1997. In 2012 it was acquired by Scotiabank, and operates independently as a wholly-owned subsidiary. Follow us on Twitter @TangerineBank. * This Promotion is available only to new Tangerine Money-Back Credit Card Accountholders who apply for the Credit Card between 12:01 a.m. ET on March 29, 2016 and 11:59 pm ET on June 27, 2016. To be eligible, new Credit Cards must be activated no more than 30 calendar days from the date Tangerine approves the application. During the Promotion, 2% Money-Back Categories will earn 4% money back for the 93-day period beginning on the date the Tangerine Money-Back Credit Card is activated. The Promotional rate of 4% money back does not apply to Cash Advances or Balance Transfers. All other Terms and Conditions for the Tangerine Money-Back Credit Card and the Money-Back Rewards program remain unchanged. If the chosen 2% Money-Back Categories are changed at any time while this Promotion is in effect, the 4% Promotional rate will be automatically transferred to the new chosen categories. Tangerine reserves the right to cancel the Promotion or change the terms of this Promotion at any time and for any reason, without notice to you. In keeping with the general Terms and Conditions of the Money-Back Rewards program, Accounts must be in Good Standing in order to receive Money-Back Rewards.